Review: Capernaum / It's Just Movies Review: "Capernaum"
“We’re insects, my friend. Parasites!” explains Zain’s father, the defendant in a trial for parental negligence. The plaintiff is his 12-year-old son who is suing both cruel parents for giving birth to him. Capernaum is a messy place of disregard where chaos and survival instincts overcome the essential values and truths of the intellect and heart. It is ever-present where the system and the people are indifferent to the suffering of others. It is the breeding ground for rage and the teaming hatchery for drugs, trafficking and human misery. Nadine Labaki is one of the world’s best filmmakers. Her work embeds the world’s most important world issues in cleverly crafted stories set in Lebanon, where she grew up during the war years of 1975-90. Capernaum, the chaotic town Jesus condemned, is a microcosm of the wretched communities throughout the world. Cleanliness is non-existent, basic humanity was lost long ago, street kids have no identity and family dysfunction fuels the mayhem. Those who are refugees don’t have the protection of statehood or the ability to get work permits. Papers proving identity are precious Black Market commodities that can be bought in exchange for a child to traffic. Zain, a Lebanese boy born to a woman who has too many children who all sleep lumped across each other in one room, recognizes this Hell and wants to get out. Though he is given nothing but parental scoldings and insults, he is a sacred image of justice and compassion in a world gone mad. Never schooled, always carting heavy loads for someone else, he knows he has no future. In real life, Zain Al Rafeea’s history closely fits his film’s character. He was born in Syria in 2004. His family fled to Lebanon in 2012. 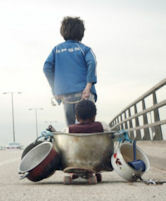 During the production of “Capernaum” he was a 12- year-old street kid who had never been to school. He also had no experience acting and could not read. However, he was specifically chosen by Labaki who named her principal character after him. In August, 2018, Zain and his family were accepted for asylum immigration in Norway. Though requiring a significant adjustment, for the first time he is in school and learning to read. Zain has won two awards for Best Actor and the film itself received a 15-minute standing ovation at its premiere at Cannes where it won the Jury Prize. Nominated in multiple categories for at least 36 awards with 21 wins (so far), Labaki’s film is also up for the 91st Academy Award’s Best Film in a Foreign Language. Labaki chose several other characters from destitute street poverty during her research and preparation for filming. Their portrayal in the movie closely parallels their real lives. Rahill, played by Yordanos Shiferaw, in real life was a refugee from Eritrea, and jailed during film production similarly as she was in the film. Post-production, her stage baby’s parents were split up by authorities and deported, the baby going with the mother back to Kenya. Whether its those fleeing the violence of Honduras, the freezing poverty of Nepal or the homelessness in cities across America, there is an ever-growing class of disregarded people who are growing angrier and more desperate. Despite the fact that the entire world is richer than ever before, these people are outcasts, unaccepted and disregarded. The cause of their suffering is the source of our greatest sin. “Capernaum” has my vote for Best Film in a Foreign Language. There is no master greater in the current cinematic world than Nadine Labaki, writer/director extraordinaire. This is the best film of the year, if not the decade.